I didn’t intend to buy Cradle of Flavor but our public library was having a small book sale and there it was. I had seen it referenced but didn’t really know anything about it. But, for a dollar, how could I go wrong? Saying I didn’t know anything about it is a bit of understatement. 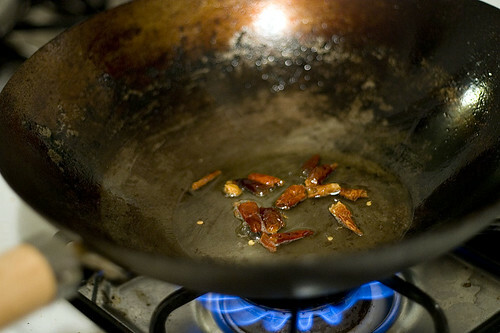 I didn’t (and really don’t) know anything about the food of Malaysia, Singapore, or Indonesia. 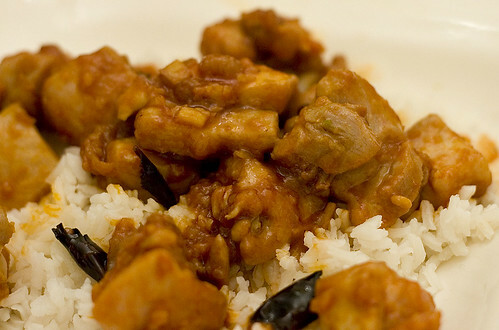 I knew that it would share some similarities with other Asian cuisines but that was about it. I’d never even eaten it in a restaurant. But, hey, it was a dollar. Whenever I look at Asian cuisine, I immediately get intimidated because I’m not familiar with so many of the ingredients. I know what ginger is but what exactly is lemongrass? (It’s a grass with a vague lemon flavor) Not to mention galangal? (It’s similar to ginger). I should mention that I hadn’t thought of looking at Wikipedia until now to get an idea of what they look like. 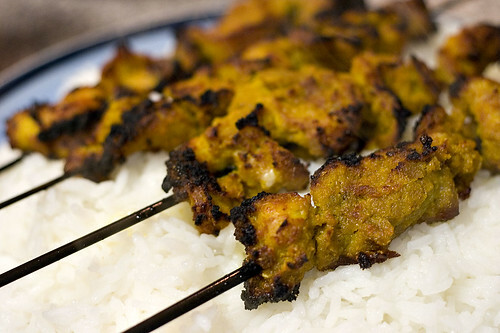 I decided to start with a dish that I had at least heard a passing reference to: chicken satay. Again, this is a dish I’ve never eaten (nor are any of the dishes in this cookbook). It seemed pretty straightforward: make a marinade, put the chicken in the marinade, skewer the chicken, and broil the chicken. The only part that was complicated was tracking down the appropriate ingredients. Lucky for us, there are any of a number of Asian grocery stores (either Chinese, Vietnamese, or Cambodian) around us. I was able to find both lemongrass and galangal there in the produce department. I used the galangal because I could find it. I did have to travel to Wild Oats Whole Foods for the coriander seeds as I had forgotten to get them elsewhere and they have bulk spices (and it only cost me $0.08). The rest of the recipe is beyond easy. 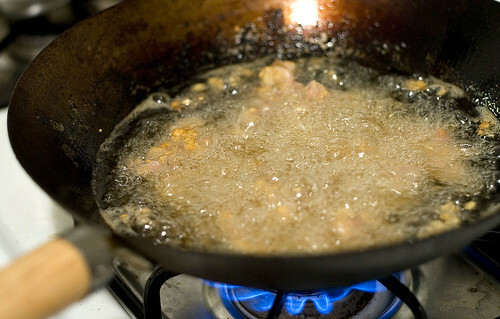 Outside of finding the ingredients, the only slightly difficult part is deboning the chicken and, if you were smart (e.g. not me), you’d buy boneless chicken thighs and be done with it. The flavor is quite a bit different than what I’m used to. In many ways, it’s the complete opposite of food being made up of simple quality ingredients. The flavor is very complex from a rather long list of seasonings. But, in many ways, it was the fact that it was so different from what I normally eat that it was good. I liked it but Angela did not. Take that as you will. Put the coriander seeds and fennel seeds in a small food processor. Pulse until the seeds are ground into a powder, about 2 minutes. Cut the bottom and top off the lemongrass, leaving a piece about 5 inches long. Remove the tough outer layers of lemongrass. The lemongrass should be pale white-and-lilac in color. Cut the lemongrass thinly. 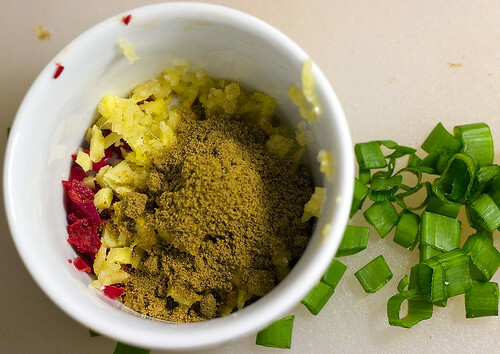 Add the remaining marinade ingredients to the food processor. Pulse until the marinade forms a paste. Put the marinade in a bowl large enough to fit the chicken. 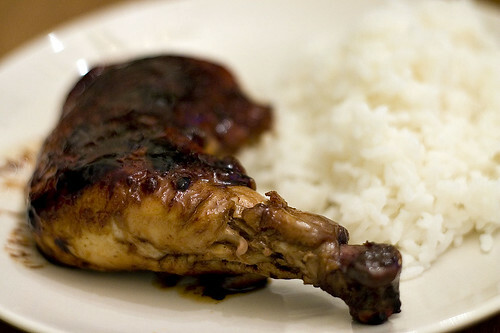 Remove the skin from the chicken and debone. Cut the chicken into thin, bite-sized pieces. Add the chicken to the marinade and mix until the marinade coats the chicken. 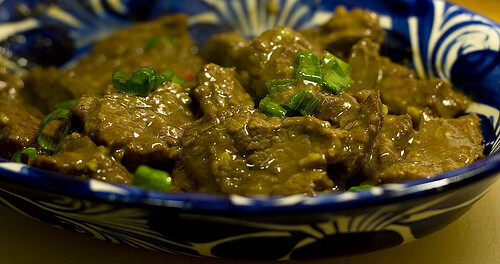 Allow to marinate at room temperature for 1 to 2 hours. Preheat the broiler for at least 10 minutes. Cut the top and bottom off the remaining lemongrass stalk. Bruise the thick end of the stalk with the back of a knife until the end becomes brush-like. 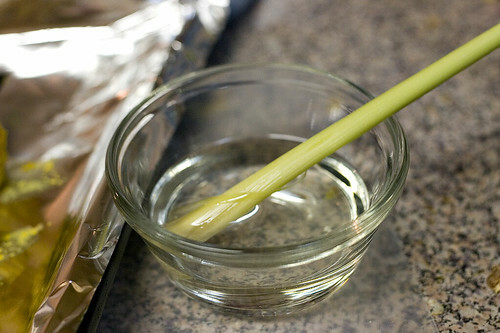 Place the brush end of the lemongrass in a small bowl containing the oil. Place the chicken on the middle of the skewers, about 2 to 4 pieces per skewer. 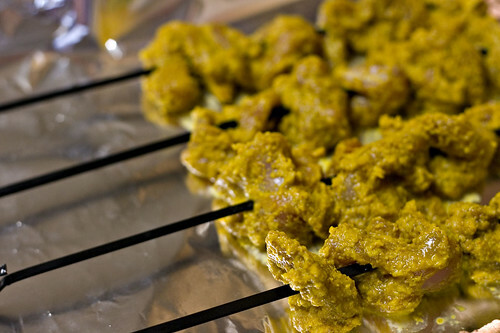 Place the skewers on a foil lined baking tray. Using the lemongrass brush, baste the chicken skewers with oil. Broil the chicken skewers for 5 to 7 minutes 3 inches from the broiling element. Turn over the skewers, baste with oil, and broil for another 5 to 7 minutes. Allow to cool for 1 minute and then serve immediately.